Google Reader is the best web based feed reader for me. After Gmail, Google Reader is where I spend the most time reading through the variety of feeds I subscribe to. If you are wondering what is Google Reader and what it does, check out this simple video. Google Reader became a little social when it let us share our favorite posts with our friend. 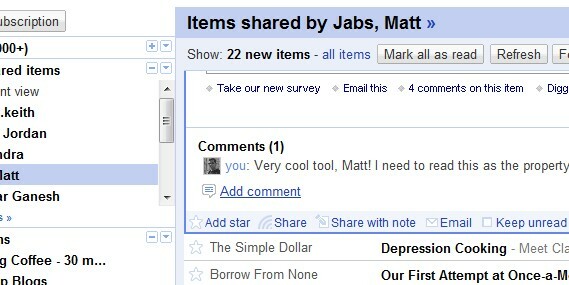 Now, we can add comments in our friends’ shared items. I share a lot of posts I like in Google Reader and read a lot of posts shared by my friends. Sometimes with notes too if I had something to say about it. But, I had no idea who was reading it and what they thought/felt about it. Now, you can leave a comment in your friend’s shared item by clicking on the ‘Add a Comment’ button. And a little speech bubble appears on the friend’s shared item indicating that there is a comment on the post. Also when you are viewing the Shared Items, you will notice a ‘Switch to Comments view’ in the right hand top corner. This shows the shared posts with comments. The comments in Google Reader Shared Items will only be visible to your friend. And there is no connection between the comment you leave here and the blog post. Great thing is you can even add comments in Google reader in your iPhone 3g. If you are a blogger, you might feel that this could take away some of the comments that could have been made in the blog are now lost in Google’s private cache. But, I think this adds an entirely new dimension to my Google Reader reading habit. I can interact more with my friends and have a conversation on the things I like and the things they share with me. Sure I might not be motivated to leave a comment on the blog post as well after I comment on the shared item. But, if it means I interact more with the people I know through another medium, hey that’s great! Google Reader has indicated that they have much more planned for the future and I can’t help but think that the ability to comment on any post in the Reader might be in the works. May be even a way to display the Google Reader comments back in the blog. If you like Google Reader, check out these Google Reader Greasemonkey scripts to enhance your feed reading experience even further. Nice headsup! I now use Google reader myself and will check out the scripts you recommend. Thanks!